Duke Shelley has 33 tackles and three interceptions this season. 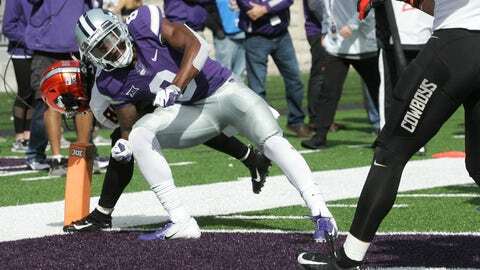 MANHATTAN, Kan. — Kansas State cornerback Duke Shelley was arrested this week for failure to appear and released after paying a $500 bond, though his status for this weekend’s game against Kansas remains in question. A school spokesman said any punishment would be handled internally. Shelley, the Wildcats‘ best cornerback, had a warrant issued by Manhattan Municipal Court after he was cited for driving without proof of insurance and having expired tags. He was arrested Tuesday. The senior from Georgia has 33 tackles and three interceptions this season, even though he has missed the past two games with a leg injury. Wildcats coach Bill Snyder expected him to return at some point this season, possibly in time for the Sunflower Showdown against the Jayhawks on Saturday.